The idyllic counterpoint to Canberra’s political center, the manmade Lake Burley Griffin stretches over 664 hectares right at the heart of the capital. Formed in 1963 by the damming of the Molonglo River, the lake has since become not only the city’s natural centerpiece, but an important recreational ground. Cruises along the lake are a fun way for visitors to admire lakeside attractions like Parliament House, the National Museum of Australia and the Captain James Cook Memorial and Water Jet, while other popular activities include kayaking, canoeing, windsurfing, dragon boating and rowing. Miles of parks and recreational areas also line the lakeside and King’s Park, Commonwealth Park, Stirling Park and Weston Park are all favorite local spots, full of walking and biking trails, barbecue and picnic areas, and swimming beaches. Lake Burley Griffin is located in central Canberra. Enjoy an introduction to the collections of the National Museum of Australia, located in the Australian capital of Canberra. Get the ultimate museum experience with a fascinating one-hour tour of the museum, and breakfast or lunch in the museum's cafe. Your meal is accompanied by one glass of wine, beer or a non-alcoholic beverage, and you can take in views of Lake Burley Griffin waterfront from the cafe. Afterward, feel free to browse the museum's exhibits on your own. When in Sydney, a full-day tour to Canberra provides a fascinating overview of Australia’s national capital, one of the few planned cities in the world. 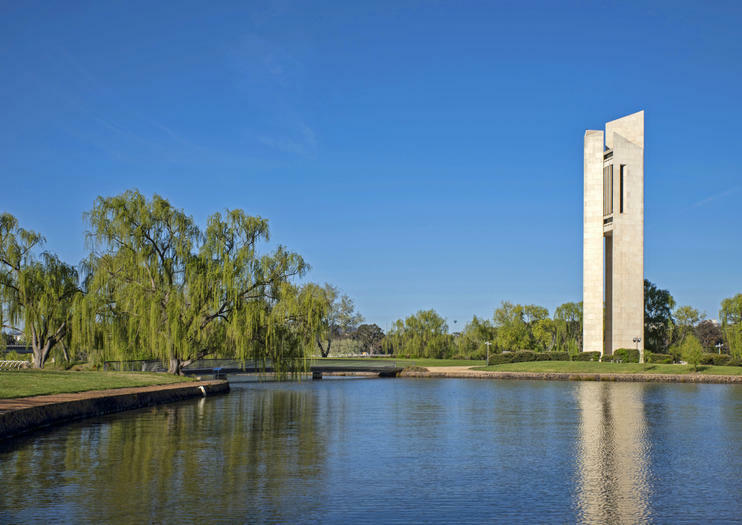 Designed by visionary architects, Canberra is home to renowned institutions including the Australian War Memorial, the National Museum of Australia, Parliament House, and the Lodge (the Prime Minister’s official residence). Stop for morning tea, lunch and dinner (own expense), and enjoy guided tours of key sites. Admire the town of Berrima, the Goulburn region and views from Mt Ainslie en route to Canberra. The MV Southern Cross is the largest vessel in Canberra featuring a fully enclosed, air-conditioned lower deck, and outer decks for outdoor cruising, relax and enjoy the picturesque shoreline while cruising Lake Burley Griffin.Our daily sightseeing tour is the best way to introduce you to Canberra and her monuments, museums and political battlegrounds. With an informative commentary and experienced crew, it’s a great way to see the sights.Our tour departs from 10am daily and features three convenient pick up points around the lake. You can then disembark at any of the same three points at the end of your tour.